You are about to see some of the worst-quality pictures I've ever posted on my blog. 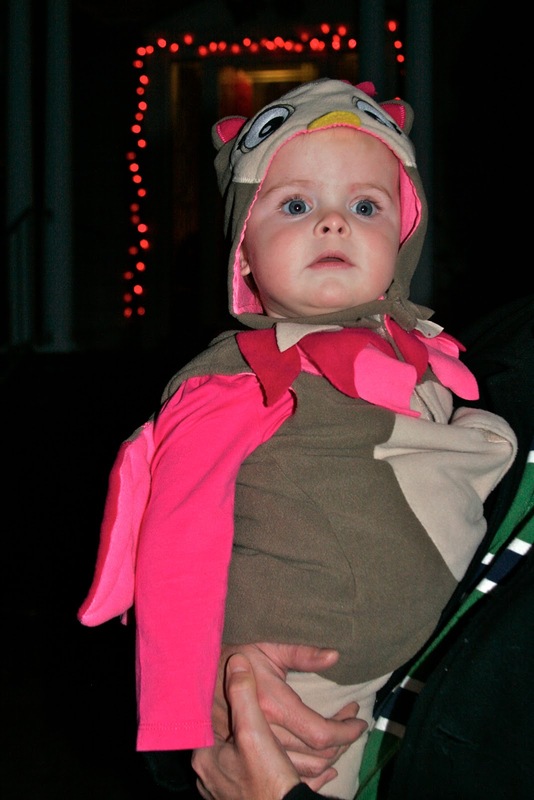 I'm heartbroken, because Amelia was the cutest little owl that you ever did see. But it was after sundown when we finally got everyone in their costumes and ready to go, and without the flash, the pictures were so blurry that everyone's faces looked like something Muench painted. 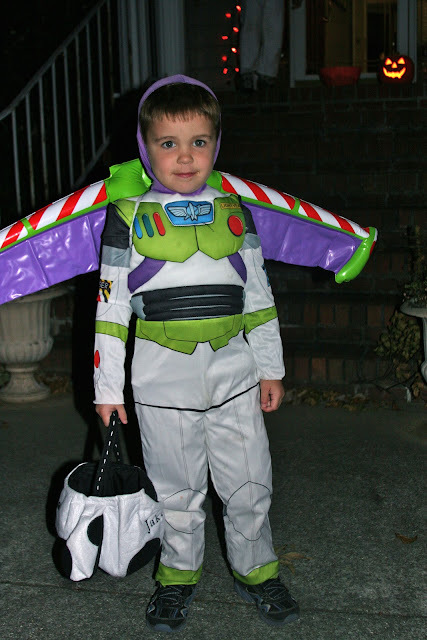 Jake was adorable in his inflated Buzz Lightyear wings, and they bobbled with every step he took. It totally added to the effect of the costume. 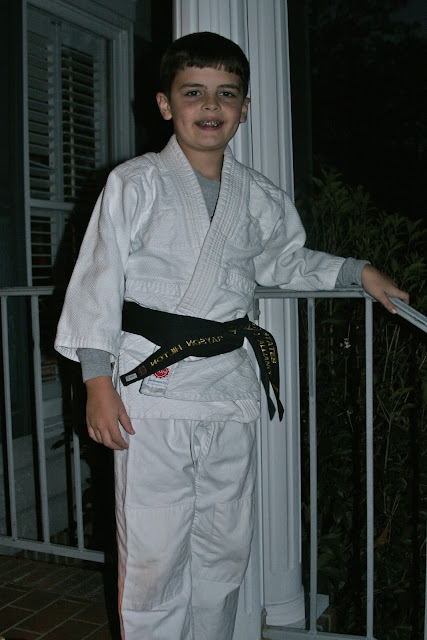 Nathaniel borrowed Grayson's black belt to add to his own aikido uniform, and I'm sure he was the most comfortable in his "costume" of anyone I saw on the streets the entire night. 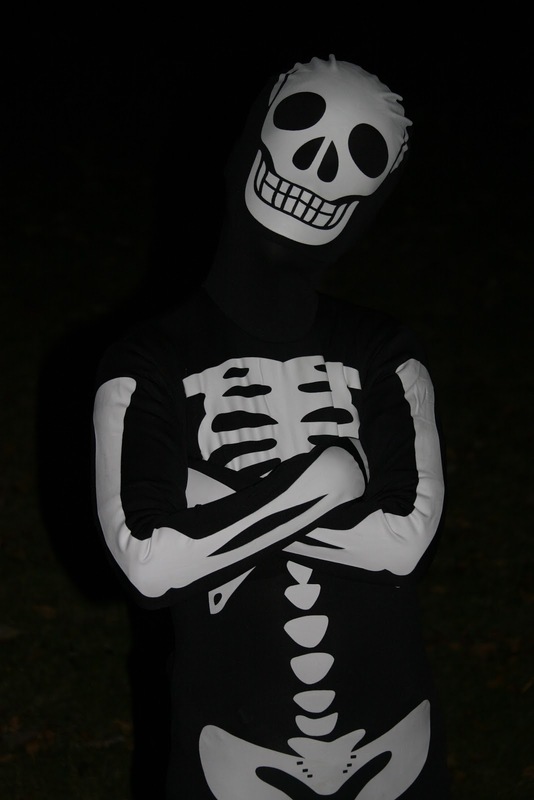 Nick was our Skelton with Attitude. He can't just be a plain old skeleton. He's gotta have panache. He truly blended in with the night sky. He wore a Morph-brand costume, which is basically colored pantyhose. Skin-tight. Desperate to get ONE good shot of the kids without a flash, right after we loaded Amelia up in her car seat, I tried a few shots on the front porch under the light. That one's not great, either. And Amelia was OVER IT. Note to self: Next year aim to leave work at 3:30 so you can have everyone dressed and their pictures made by the time the sun goes down AT FIVE FREAKING THIRTY. At 6:30, we met up with Nick's friend Drake's family (yes, THAT DRAKE) in a nearby neighborhood, and we traipsed around with them for about an hour and a half. Nick's mask made it about eight minutes before his "eyelashes started hurting," so the mask had to come off. But really? I didn't mind. It's a crime to cover up that face, isn't it, Internet? Lots of candy was received, and we walked until we could walk no more. And when we got home, we traded out all of Nathaniel's hard and chewy candies for Reese's Cups, Twix and Kit Kats, which I had bought for that purpose. The goal is not to break our braces the first week they are in his mouth. 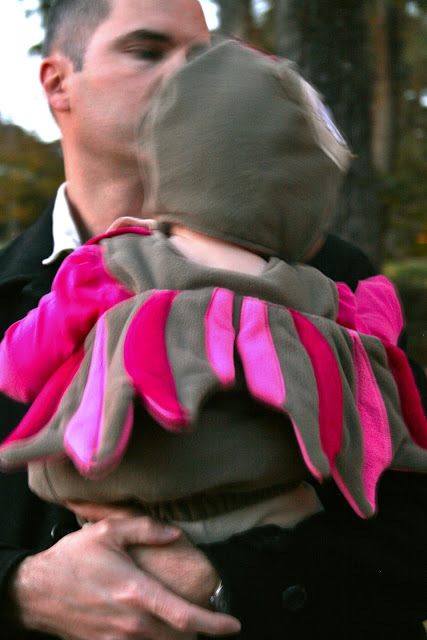 Bad pictures or not you still and some adorable trick or treaters. Or should I say 2 adorable, 1 scary, and 1 tough.